When people think of common core they think of English and Math. However, all subjects are part of the common core. In science, along with our science standards we have the common core science literacy standards. One of the key parts of the common core standards for science is having students support their claims with evidence. 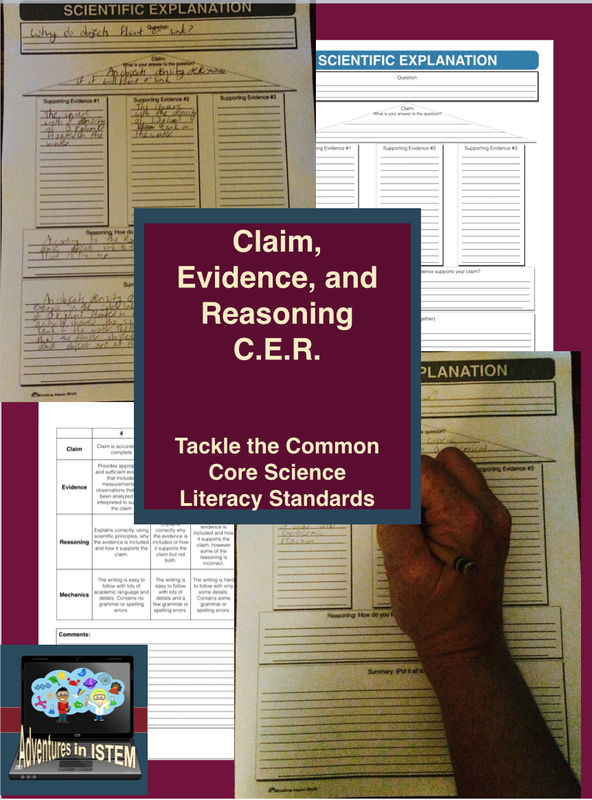 To help students with this teachers can incorporate the CER model: Claim, Evidence, and Reasoning. 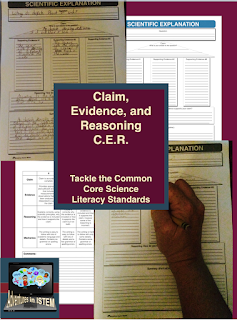 I first came across this model in the book: Supporting Grade 5-8 Students in Constructing Explanations in Science: The Claim, Evidence, and Reasoning Framework for Talk and Writing. I was very intrigued about this model and like anyone searched for more information on the topic. I found a video on youtube created by Matthew d'Alessio. In this model the students state their claim, the answer to a question. They then support their claim with evidence. This evidence can come from text, from data, from observations,... Finally, they use reasoning to explain why the evidence supports the claim. I have found that for middle school students they catch on pretty quickly with the concept of supporting their claim with evidence. After practicing a few times they were able to find evidence to support their claims without help. The struggle they had was with the reasoning. Although they could tell me the basic idea of the concept, they had a hard time making the connection between the evidence and the claim. To help them with the reasoning I found that asking them what they already know about the topics and reviewing what we already learned in class with the textbook or our flipped video helped. I also created a template that helped the students organize the claim, evidence, and reasoning before putting it into a summary. I have the students use it in their Big Idea summary of the unit and also in the their lab reports as their conclusions.